WE’VE HIT A NEW LOW. AND WE COULDN’T BE PROUDER. THE ALL-NEW 12' AND 10' TALONS We’ve lowered the anchor, raised the bar and silenced the competition. The new 12' (3.7 m) and 10' (3 m) Talons are completely redesigned with a new motor that’s 30% more powerful, 30% quieter and 100% guaranteed to be the last shallow water anchor you’ll ever need. SHALLOW WATER ANCHOR GAME ON. GLOVES OFF. MEET THE MOST ADVANCED SHALLOW WATER ANCHOR EVER. No shallow water anchor makes a statement like Talon. Our unprecedented new 12' and 10' models feature bold new color options, and they give sh nowhere to run and nowhere to hide. 30% MORE POWER Anchor anywhere, and retract any time. The new Talon gives you all the power you need for any situation. 30% LESS NOISE Hit the water completely undetected. The new motor is 30% quieter, so sh can’t hear Talon coming. THEY COMMUNICATE. YOU DOMINATE. Screen simulated Say hello to i-Pilot® Link™. The world’s most advanced fishing system lets your Minn Kota® trolling motor communicate with your Humminbird® shnder to change the way you sh. Link delivers automatic boat control, the ability to store and return to your most productive shing spots and tracks, and the intelligence to follow depth contours automatically. And, you can take control from your Humminbird or the wireless Link remote. 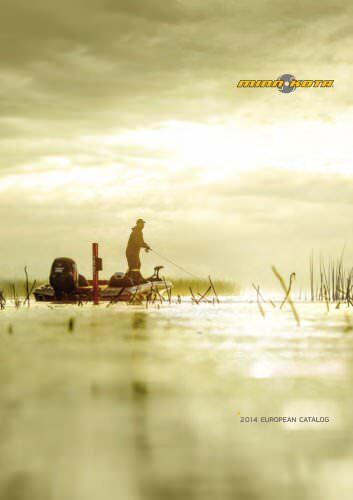 See all the ways Link is changing fishing on the following page.